Happy Friday! Even though it does NOT feel like it, Christmas is almost here and it is almost officially winter. We’ve had some insane weather lately – lots of 70 degree days and humidity. Despite that, it is the middle of December and Christmas is in less than a week! So this week, for the Friday Five, we are sharing our favorite winter activities. We did a post just like this last year and that list still stands for me (you can find it here). 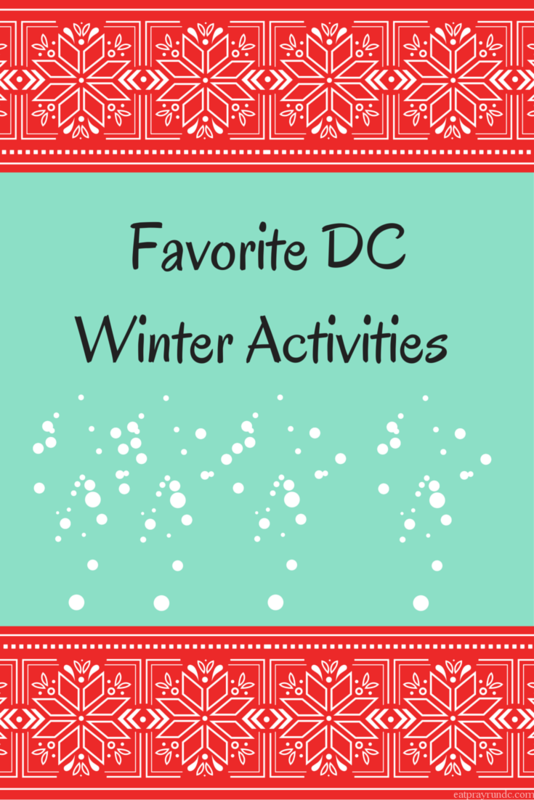 For this year’s list, I decided to focus on things that are unique to DC – so this is my list of my favorite DC winter activities. You can of course find versions of these things in your town, but these are some of my favorite things to do this time of year in the Nation’s Capital. Per usual, I’m linking up with my girls Cynthia and Mar for the #Friday Five. You can read our linkup rules here. Please note that if you don’t play nicely, we will delete your link. Have a great weekend! 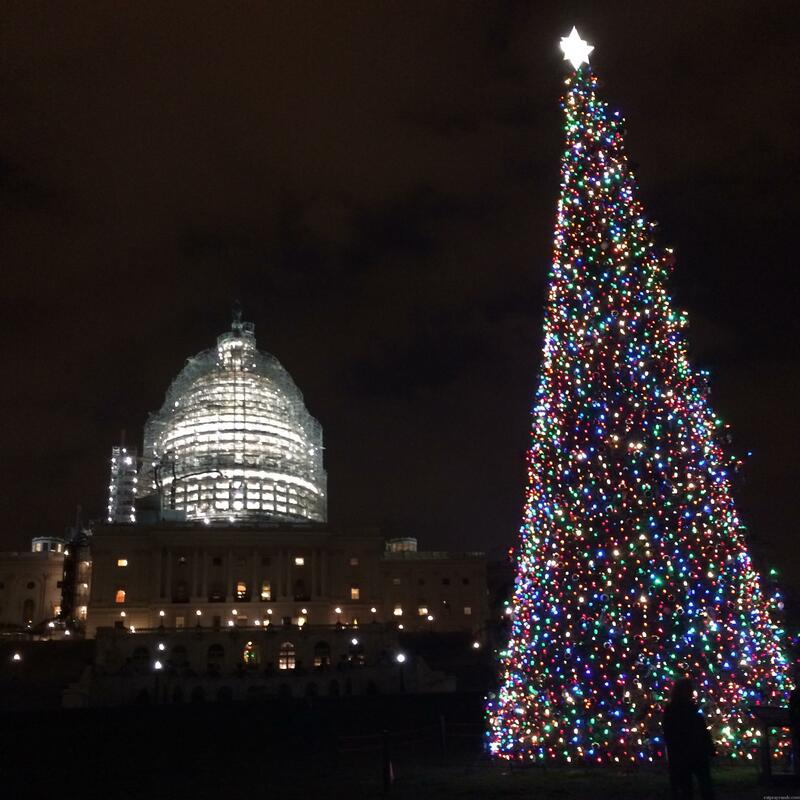 Yes, holiday lights are everywhere, but where can you get the (still under construction and not looking it’s best) U.S. Capitol building with the Capitol tree? Only in DC, baby! Okay, this is not a true “winter” activity but running around town in DC, you truly never know what’s going to happen. Last weekend while on my long run, my gals and I came across a crew filming the CBS show “Person of Interest.” Obviously we stopped and took some pics. It’s something that actually doesn’t happen much in DC, despite the plethora of shows that are based in DC – very few actually film here so it was fun! Note that I’m wearing shorts. On December 12th. Yep. Global warming, y’all. This one is less about the tree (which is pretty) and more about the location – we were at the Williard hotel and had a fancy drink in their Round Robin bar. We were definitely the only ones there in running gear, but it was fun nevertheless. I love the Williard during Christmastime. Carolers, beautiful decorations and just all around awesome. I recommend it for a visit if you find yourself in DC this time of year. What beautiful Christmas lights! I would love to run around DC!! I am jealous of your beautiful views. ZOO LIGHTS!!!! I almost lost it the other night when I got caught in ZL traffic trying to get to the gas station. I was like why is it so crowded right now. Typically I walk there. Anywho, great list. Love the holidays in DC 🙂 can’t wait for Sunday’s run – I’m gonna DVR the rest of my game! It has been very warm here as well. Which I am not complaining. It’s suppose to get much cooler this wkend unfortunately. I think winter is about to come. DC has such beautiful lights. How cool you got to see filming crew while you were out. Yes, the film crew was a really nice surprise! The National tree and state trees were insane when we were there last weekend while we waited for our turn for the White House tour. But man, who can turn down getting into DC in this weather??? It wasn’t so bad when I was there. But we didn’t stay too long. I think it’s going to be more fall like this weekend? I can’t believe the weather there, 70 degrees…wow! It’s rainy and cold here in OR, seems like the usual to me. Great list! Lol, I think it’s funny the police officer who took you pic didn’t get one where you can actually see you all. Love holiday lights! I was like “what?!? !” when I saw that pic, lol! So coincidently, I did a post on fun Philly winter stuff! Love it! My BFF lives in DC and I was hoping to head down there for a quick visit while I’m in Philly, but I’m sure I’ll be too busy. But I’ve always wanted to see the Zoo Lights there! They’re awful here in Anchorage, plus I’m obsessed with Bao Bao. PS the capitol christmas tree this year is from Alaska! 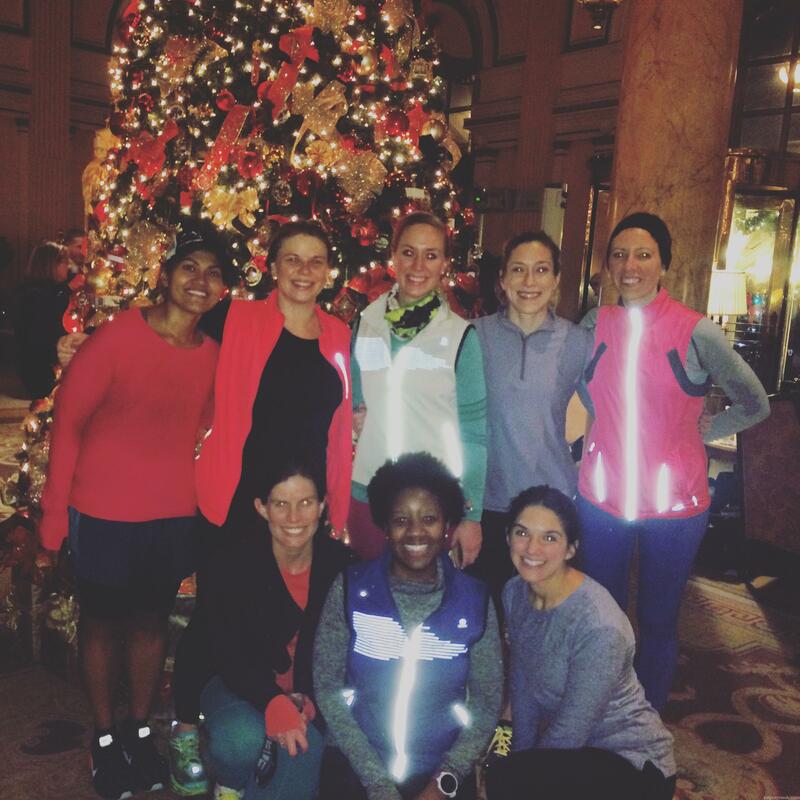 Kristen recently posted…Friday Five: Five Favorite Winter Activities in Philly! Aw fun!! If you do make your way to DC let me know! You guys have some nice sights during the holidays in DC! I don’t think I have ever been there during this time of year. I wish I had planned a visit to check out some of this stuff, especially with the warmer weather this year! Yes, DC is lovely during the holidays – so pretty! I never did get to see the tree the one year I lived in MD; I probably went home & also probably didn’t want to go by myself in the dark. I did get to got to the mall on the fourth & I also got to the Preakness. I used to love wandering around DC & sadly I haven’t been back since I got married — 30 yrs! We’ve never been to Zoo Lights! We did “Boo at the Zoo” once with the kids, but that’s the only special event we’ve gone to. I probably could plot a good route from my office up to the zoo, but I think they open later in the morning now for my usual runs. Love all your holiday pics. Oh you should go before it gets really cold 🙂 it’s super fun!! We have Zoolights here, too, and I really hope that I will get to go! I just don’t want to go by myself waaaaahhhh stupid husband who works all the time. It finally feels a wee bit wintery here in Chicago. Running the Rudolph Ramble in shorts and short sleeves and mud was just weird. DC looks beautiful at Christmas time! I think I have only been in January – March – never December. I have seen our Zoo Lights from the highway and local roads and during the day. It has been SO crowded! One unexpected pretty place here is O’hare! What an amazing place to celebrate! So beautiful! I need to come to DC! Yes you do, lady! We’d have fun – I would mob to give you a running tour of the city! All those lights are so pretty. We have a neighborhood in town where people can walk or take a carriage through and see all the houses lit up. I can’t believe I’m saying this but I’ve still never seen the White House tree after having lived here for like 20 years. I’ve got to change that at some point. I love zoo lights though. This post is SO FUN. Love the holidays in DC. 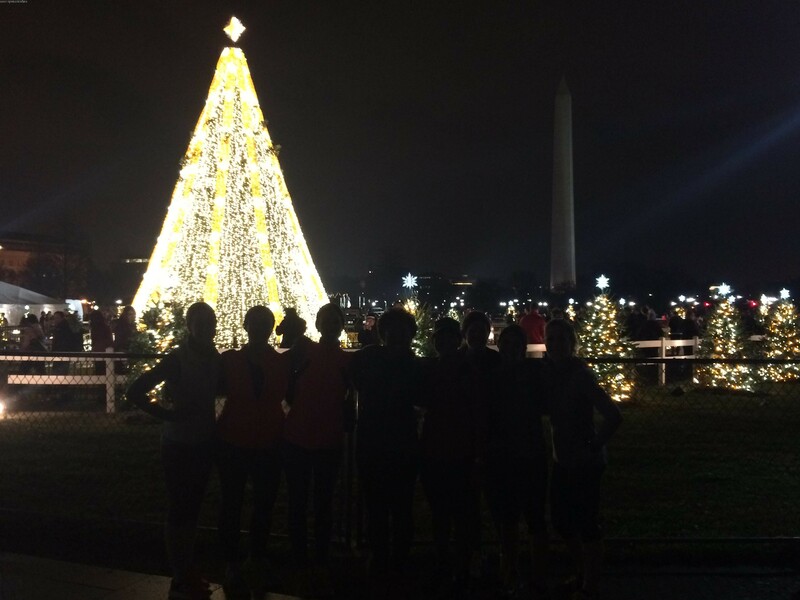 Running around DC always looks cool, but Christmas time takes it to a new level. So many great displays! It’s also pretty great that you saw Person of Interest filming. Running through a Zoo is something I need to add to my bucket list. And with Christmas lights all about, it would be even better! ooooo DC looks gorgeous all lit up! I love going to see the trees downtown at this time of year. We weren’t able to make it downtown earlier in the month, and with my due date right around the corner I’m not sure that we’ll be able to see the lights this year. Good thing I can look forward to seeing them next year! 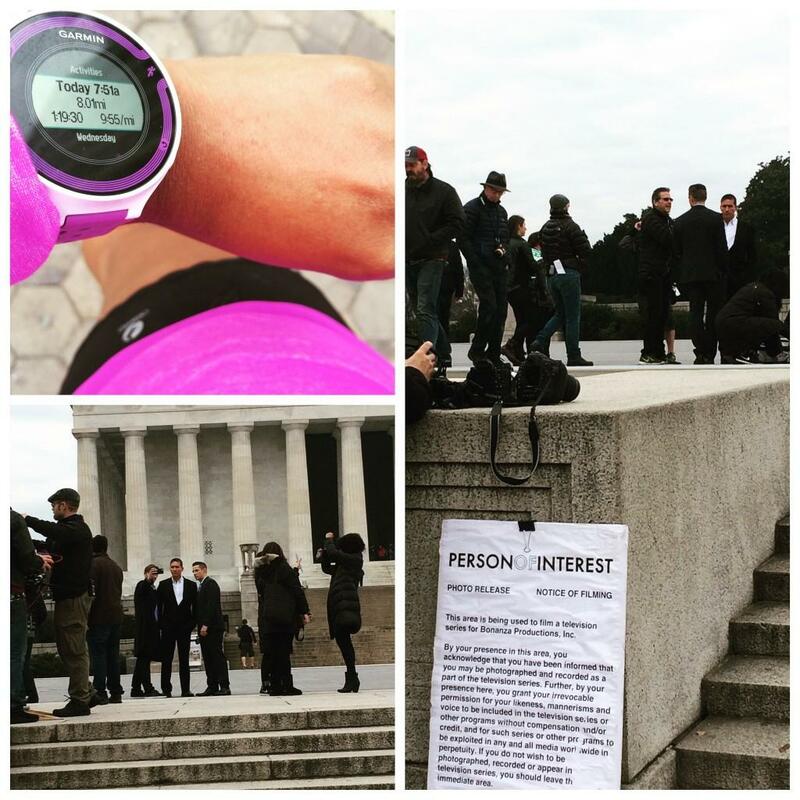 I would love to be able to run around DC! Thanks for sharing! I’m hoping to make it to the Botanical Gardens this year for the holiday display – missed it last year! I went to the Zoo Lights at Chicago’s Lincoln Park Zoo for the first time this weekend! My friends and I had loads of fun – it was soooo weird being at the zoo at night, in the dark! Like DC, LPZ’s zoo lights was free – although the zoo is free and open year round as well…it’s basically just one more part of the surrounding parks. That White House cop dude definitely should not quit his day job. We still look cute in silhouette…. So fun that you saw a show being filmed!! One of my friends lives in Baltimore and they used a film a DC-based show on her street 🙂 I did most of these activities minus the Williard Hotel. Have you heard of Miracle on 7th? Apparently it’s a bar that gets all decked out for the holidays. One of my friends went this past weekend and it looked so cool!